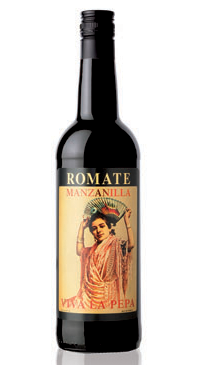 Romate is a family run house that has been producing fine Sherry (Jerez) since 1781. The key factors in crafting this wine style are the white Albariza soils, the Andalusian sun and the native grapes, Palomino, Airen and Pedro Ximenes. The production process for Sherry is a long and relatively complicated one with many steps in which Romate combines traditional and modern techniques in order to create a consistent quality product. Made from the Palomino Fino grape. Manzanilla is basically the same as Fino sherry but produced and matured around Sanlúcar de Barrameda, closer to the sea than Jerez. The wine is a bright, pale, straw-like colour with aromas of chamomile, toasted almonds and bakery sweets. It is dry, fresh and delicate on the palate with a pleasantly bitter finish. Enjoy this with appetizers, cheeses, Iberian ham and dried fruit.